Wondering if you need a new SUV? The latest vehicles from Ford are certainly ones that should be on your list. One of our top picks is the Ford Edge ST because of its performance and interior style. You’ll be able to go anywhere in this SUV, while also getting excellent power. The Edge ST is the only model to have a twin-turbocharged V6 engine for the price range in this market. This means that you can get exceptional power for the least amount of money with the latest deals on the Ford Edge ST. In addition, it’s a composed, comfortable ride that offers all of the same space inside of the cabin as the Ford Edge. The acceleration and handling are superb in this version, so you never have to worry about steering or finding your way in the snow. That’s what all-wheel drive is for. There are a few things that people love about this vehicle, such as the technology package that now includes blind spot monitoring. 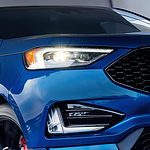 Want to get into a new Ford Edge ST? You can test drive one at Sheehy Ford Warrenton.